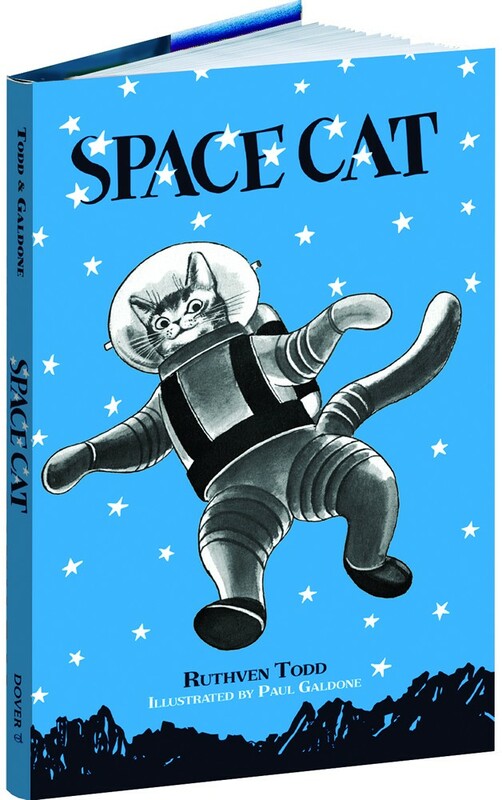 Get ready for a mid-century blast-off with Space Cat! Dogs in space, monkeys in space, fruit flies in space: these are some of the first living creatures sent beyond Earth’s atmosphere. 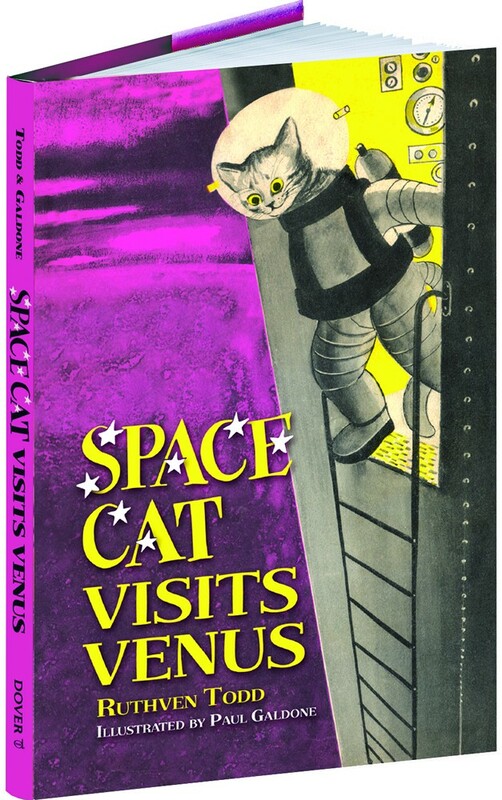 But according to a series of four children’s chapter books by Scottish author Ruthven Todd, Flyball was the first cat in space. Clearly, Todd’s imagination was captured by the international space race as much as any child gazing up at the sky on a clear night. Flyball is an adventurous kitten, which is not hard to imagine: most kittens are curious and therefore bold. After hitching a ride to the airport and then making his way onboard on an airplane, he’s taken up (literally) by Captain Stone. The new friends are quickly on their way to adventure! Captain Stone arrives at his duty station, Flyball tucked under one arm. One of the most charming things about this moment is Flyball’s immediate and unremarkable admission to the space program. Captain Stone receives orders from his colonel (and a dressing-down) — while stroking Flyball’s ear. The colonel makes no remark about the cat. 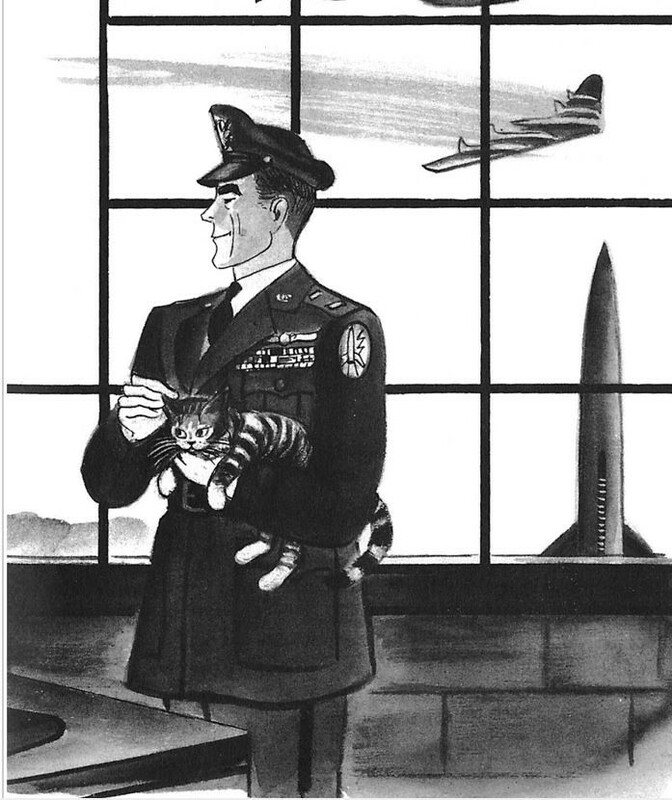 Captain Stone and Flyball ready for their first mission (art by Paul Galdone). And so a custom-sized pressurized just-right-for-a-cat spacesuit is created for the little creature. The next books take Flyball and Stone (promoted to Colonel!) to Venus and then to Mars — and there must be a wife for Flyball at some point since the fourth book Todd wrote includes more kittens! Ruthven (pronounces “riven”) Todd was a writer and thinker who worked across boundaries and genres. He was an expert on poet William Blake, wrote mystery novels, and was himself a surrealist. The latter probably influenced his Space Cat series and the wonders found on Earth’s moon, on Mars, and on Venus. Illustrator Paul Galdone created the lively illustrations, enhancing the creative stories of men, machines, and cats in space.